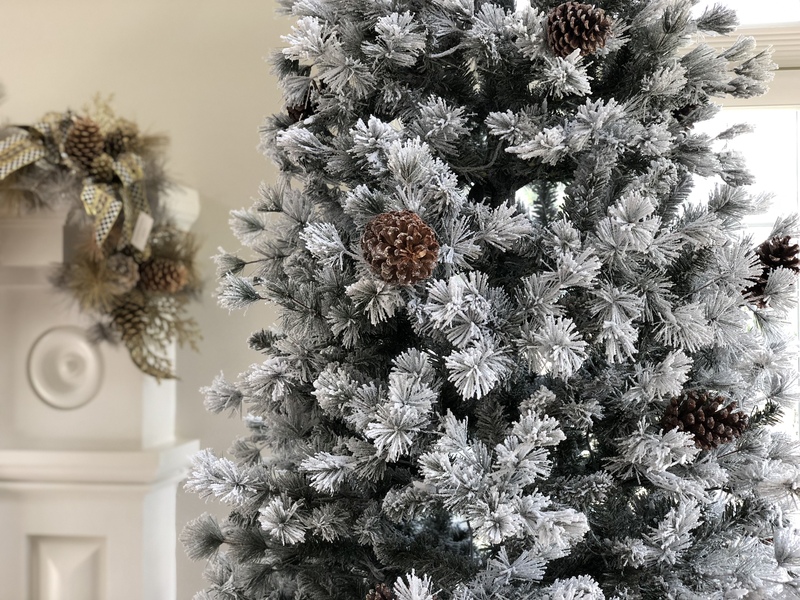 When is comes to artificial Christmas trees, there are a few easy steps you can do to make them look as good as a live tree. Before we start with the assembly of the tree, we need to consider a couple things. First, it is important to choose the best location for your tree. You will want to place your tree where your family spends the most time and you can enjoy it everyday during the season and place the tree in a location where you can enjoy all angles, not just the front. It may be necessary to measure the space first to make sure your tree will fit the area. Measure the circumference of the bottom of the tree, most trees have that listed on the box. Also ensure your tree is the appropriate height for the room and not too tall. If you have a small tree, pick a location that fits the scale of the tree. If your heart is set on a particular location but the space is cramped, you can always move furniture around which is what I did in our sunroom, and I really like the new configuration. Having a beautiful full looking artificial tree is not as hard as it looks, it just takes a bit of time to achieve. Here are my 3 tips to setting up a full and natural looking Christmas tree like a Pro. This first tip won’t affect the appearance of your tree but will protect your floors from nasty scratches. After you have set up the tree stand, place a piece of fabric on the ground under the tree stand. I used bubble wrap but I suggest using something that will slide easily like a piece of cloth, fabric, or even a towel. Once your tree is set up, you will most likely want to move it to get the perfect placement in your room, whether it be a few inches to the left, or few inches to the right. Having a piece of cloth on the ground will protect your floors when you slide the tree. Another option, which I like and works really well is to use a rolling tree stand HERE. With this stand, you can slide your tree not just inches but from room to room! This one is going to take some time, but is well worth the effort. This is my least favorite part of the tree assembly process but it is critical to having a beautiful tree. Begin by placing the bottom piece of the tree into the stand. Secure the tree by tightening the bolts or ring of the stand, which will hold it in place and straighten it as well. My tree was brand new and packed so tight, that the branches stayed in place even after I inserted it in the stand, which worked to my benefit. I pulled down each branch, one by one and fluffed and shaped them individually. It is important to lift and separate the inner branches that are closest to the trunk of the tree. Lifting the inner branches straight up or to the side will create fullness and hide the trunk. You want to create a “fan” effect by lifting each tip. Continue to work your way up the branch to the tip and separate and spread each tip. You should have spread and touched every single tip on the tree by the time you are done. I also suggest using gloves to fluff the branches, as they can be prickly and scratchy. I used my versatile white gloves HERE that I have lying around the house. These inexpensive gloves are amazing, you can read how I also use them to clean my crystal chandeliers HERE. I have spread and fluffed every branch and every tip of the first piece of the tree. You can see that many branches are pointed upwards and each tip has been spread. Continue with the above steps for each section of your tree. Step away from the tree from time to time and check on the overall appearance and any areas that may need additional fluffing or spreading. The second piece is up and fluffed. You can choose to fluff the top piece before you place it into the tree, to avoid having to fluff on the ladder. But I like to live dangerously…that is until the day I fall on my face into the tree! The top piece is fluffed and looking great! I am happy with the overall appearance of the tree so far. I have found this method to be easier and more effective than fluffing and spreading after the tree is fully assembled. Fluffing and spreading after the tree has been set up makes it harder to keep track of which pieces you have fluffed and which ones you haven’t. It also feels more daunting and time consuming. I have done both ways and much prefer fluffing as I insert each piece of the tree into the stand. My last tip for creating a beautiful and full looking tree involves the bottom layer of the tree. Sometimes on certain trees, there appears to be a large gap between the floor and the base of the tree. To minimize the appearance of that gap, point the bottom branches towards the floor. It adds an extra layer of interest and gives the tree a more interesting shape. If you are looking for furry inexpensive tree skirts, check out this one HERE. Those are my tips for assembling a beautiful Christmas tree. I hope you find them useful and create a beautiful tree of your own. Do you have any tips to share? For more informative posts about the holidays, subscribe to Happy Haute Home and follow along on Pinterest HERE, and Twitter HERE and feel free to pin and tweet your favorite pics from Happy Haute Home. You are very welcome, glad you found it helpful and thank you for stopping in!